Apart from conventional marketing strategies and paid advertising, Restaurants have always relied on word of mouth to reach out to their customers and build their brand. From $100 cheesesteaks to iconic commercials we have seen prominent restaurant chains coming up with new strategies each day to get their loyal customers talking about them. The era of the internet added a whole new dimension to the marketing of restaurants. According to a recent survey, the millennial customers prefer to check out all available information before trying out a new place. In fact, 80% of the customers trust online reviews as much as they trust personal recommendations. While the proliferation of the internet presented opportunities to showcase your brand to a wider audience, it also presented several challenges. Maintaining an online presence does not cut the mark, you have to constantly monitor and update your online listings. online ratings and reviews play a major role in attracting customers to the restaurant. A negative review no longer remains constrained to the immediate friend circle of an unhappy customer, rather it can reach millions of your potential customers. 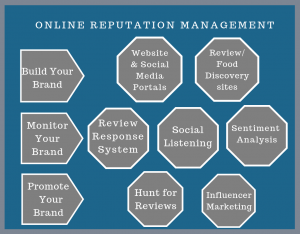 Online Reputation management is therefore extremely important for your restaurant. Apart from your website, social media provides multiple platforms to build and promote your brand. You would want to ensure that your online identities are a reflection of your brand. Devote some time to developing your profile on sites such as Facebook, Instagram or Twitter. Post enticing pictures of your food and restaurant. Provide all information which you think your customer could use like location, phone number, your business hours, your website, online ordering link and your menu. If a publisher doesn’t allow you to add a menu, listing your website with other relevant information would also suffice. Keep your pages updated with the latest information on offers, specials and menu items. Listing your restaurant on online food guides and review sites like Yelp, OpenTable or Tripadvisor is an option which you would not want to miss out on. 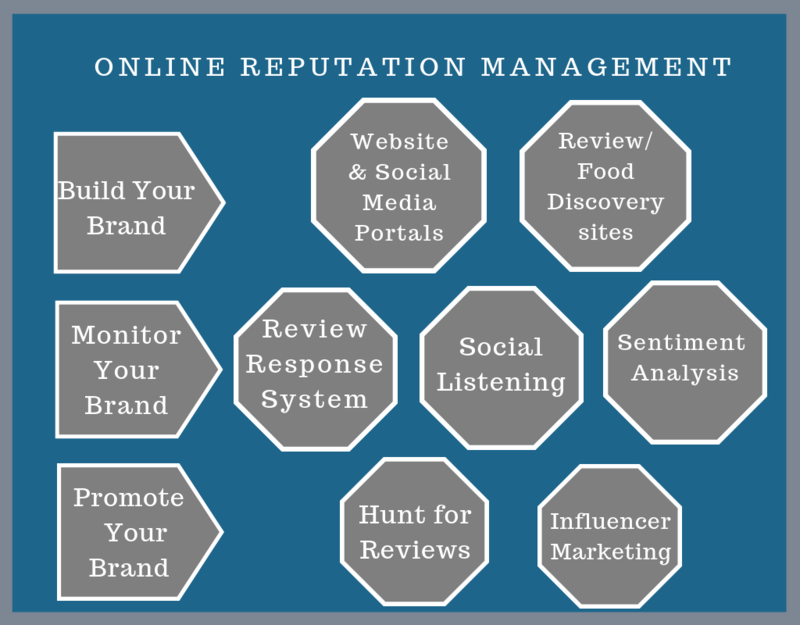 Apart from giving you an access to a much wider audience, these platforms can also help you to leverage from positive reviews. Spend some time sprucing up your profile on these sites and showcasing your best products. Double -check to ensure that you have provided all information that may be helpful to your customers. Maintaining and Updating your online identities is only half the task, the next big challenge is handling customer reviews. Customers can also leave a review or feedback on your Facebook, Google or Instagram page apart from review sites like Yelp or OpenTable. Replying to reviews both positive and negative should be an important part of your strategy. A negative review can do substantial harm to your business. You should be very careful while handling negative reviews. At no point should your customers feel that you do not value their opinion. Be polite and assure your customer that their grievances will be addressed. We, at mKonnekt, have experienced several instances where we turned around a beleaguered customer into a loyal advocate just by replying to their reviews. My personal favorite is the time when a customer- after reading our response- went back ad updated his initial review and even gave our client extra star for the quick response to his review. While dissatisfied customers never waste a minute in expressing their discontent over one or more sites, you would usually need to nudge a happy customer to leave feedback. A solution to this would be to have a well-formulated strategy to collect feedbacks. The age of collecting feedback on flyers is long past, you should be using a digital tool like Kritiq which allows customers to offer feedback at the time of checkout. You should also be training and incentivizing your staff to collect customer feedback. Many restaurants even go to the extent of offering a surprise gift for a customer who left a positive review. This small gesture may a long way in building a loyal customer base.